December 3, 2014 - The U.S. Department of Transportations Federal Aviation Administration (FAA) is proposing a $97,500 civil penalty against IBC Airways, Inc. of Ft. Lauderdale, Fla., for allegedly operating as a scheduled air carrier without the appropriate FAA certification. 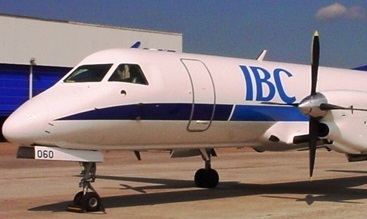 IBC Airways is an on-demand carrier that is also authorized to offer and operate up to four weekly scheduled flights using aircraft with a maximum of nine seats. The FAA alleges IBC Airways operated three Saab 340B aircraft, which have more than nine seats, on a total of 54 scheduled flights between July 1 and August 17, 2012. The FAA alleges that IBCs on demand authority did not allow the company to operate these scheduled passenger carrying flights with the Saab 340B aircraft. IBC Airways operated the flights between Ft. Lauderdale-Hollywood International Airport and Guantanamo Naval Air Station in Cuba and Norman Manley Airport in Kingston, Jamaica, and between Miami International Airport and Guantanamo Naval Air Station. The FAA discovered the alleged violations during an inspection. A year ago today, IBC Airways lost a Fairchild Metroliner and two pilots when on December 2, 2013, Flight 405 "Chasqui 405" had departed Santo Domingo, Dominican Republic for San Juan International Airport, Puerto Rico. At about 8 PM the Fairchild SA227AC Metro II, registration: N831BC crashed during a rapid decent near La Alianza, Puerto Rico killing the captain and the first officer. The NTSB is continuing to investigate this crash, to date the circumstances of the crash remain unknown. Family members of the copilot, Steve Gullberg had concerns with company maintenance on the aircraft. Gullberg's brother said, "He was expressing concerns with my dad about maintenance issues. When they would mention these maintenance issues to management, they were just shrugged off." Greg continues: "This was an accident waiting to happen, and it was going to happen sooner or later. Unfortunately, it happened sooner, sooner than we would have hoped." "The planes are very old, and some of the upkeep of the air planes was a concern to me," one former IBC Air employee tells New Times, requesting anonymity. Although the company was involved in no other crashes, the pilot says the issues were well known among the company's flight crews.